Everyone has their "go-to" mascara. However, I truly believe that the same mascara can look completely different on two separate people. 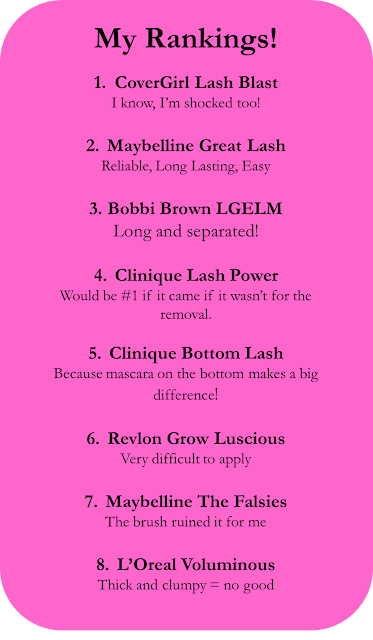 At the urging of a friend, I decided to go through my drawer and do a review of the mascaras I have on-hand. It took 8 days...hence the title of this blog! Most of these are drugstore buys because I'm not a big believer in spending lots of cash on mascara for day-to-day use. The only one I bought specifically for this was the CoverGirl Lash Blast because it was on-sale for $5 bucks in the Target check-out line. I'm such a sucker. Application: The small, straight brush and smooth formula makes application a breeze. I would consider this more of a lengthening mascara vs. volume because it's easy to apply multiple coats without clumping. I could apply this mascara in my sleep because it's so consistent through the entire bottle. Mid-Day: Looks even better if that's possible. No smudging or flaking. End Of The Day: Still looks great. I could easily apply another coat if I were going out that night with out any issues. Just a great all-around, reliable, go-to, black, waterproof mascara. Phew! No wonder this has been my staple for years! Application: I was not excited to try this because I previously bought it and HATED it...but it was on sale for $5 so I thought I'd give it another try. The brush is fairly large and has rubber bristles which I've never been fond of. I was pleasantly surprised to find that I actually really liked this the 2nd time around! The large brush makes application a little tricky as it's super easy to get mascara on your lid. 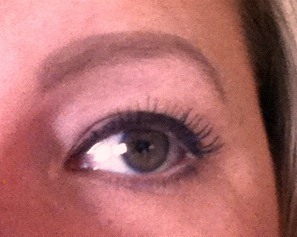 However, the actual mascara went on like a breeze and coated my lashes beautifully. 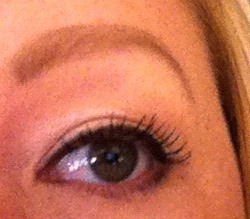 Mid-Day: Lashes still look just as long and separated as when I applied. End Of The Day: I hate when I'm wrong but I was definitely wrong about this mascara. It's pretty awesome. However, if you are the girl putting on your mascara in the car...this isn't for you! (and stop doing that you're going to kill someone!) It takes a few extra minutes to apply without any mistakes and you definitely need multiple coats, but the end result is worth it. Application: The brush is a full natural bristle brush (which I like) however the mascara is very sticky and thick. So if you don't get your first coat on evenly, applying a 2nd coat is darn near impossible. 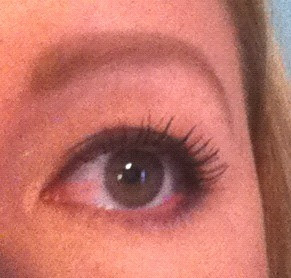 It clumped quite a bit and so I had to spend a lot of time separating my lashes with a brush afterwards. Mid-Day: I can tell my 2nd coat has flaked off a bit. My lashes look shorter. End Of The Day: Confused. This mascara is legendary yet I hate it! Apparently Kim Kardashian swears by this mascara and her lashes always look amazing. Maybe I'm just not a big fan of soley thickening formulas. Oh well. Moving on. Application: Love, love, love this brush. It's the perfect tapered shape (smaller on the outsides, larger in the middle). My fist coat goes on really smooth with zero clumps. Happy girl. End Of The Day: Looks just as though I just applied it. I wore this for my wedding because apparently it was tsunami proof - - and it is. It doesn't even come off with makeup remover! Which is my biggest (and only) complaint. It's made to only come off with warm water...which is just weird. So I always forget that and then spend 5 minutes scrubbing my eyes with makeup remover before I remember - warm water! Then when I do the warm water thing, it looks like I'm washing my lashes down the drain because it comes off as pieces. I'm no expert but I'm assuming this formula is some sort of gel coating for your lashes. 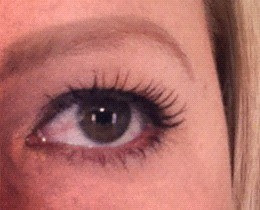 Application: One time, I woke up and realized a huge portion of my left eyelashes were like half their size! Needless to say, I freaked out and then immediately went and bought this mascara. The brush is big and fluffy with natural bristles. 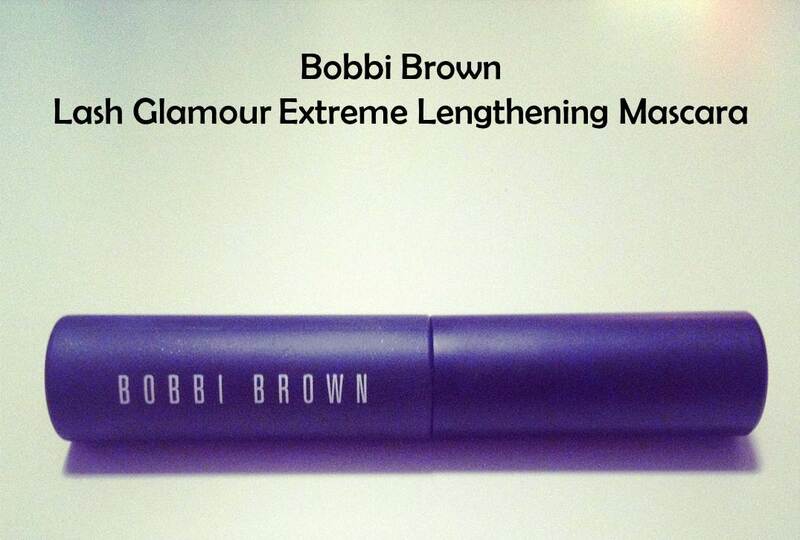 The formula is less thick than the Voluminous but still goes on as more of a volume mascara vs. lengthening. This took me a long time and many coats before I felt like I had enough on. Mid-Day: Definitely looks like I have less on. End Of The Day: Did I even put mascara on this morning? It vanished! Which is weird because I had applied it pretty thick that morning. So maybe if you don't like wearing lots of mascara or just like a really natural look, then this could be the mascara for you! If you've used this and you've noticed that your lashes have grown, leave a comment below and let us know! Application: I love Bobbi Brown. She really can do no wrong in my book. So of course, I'm a fan of this mascara. The brush is rubber, yet has much longer bristles than the CoverGirl Lash Blast. 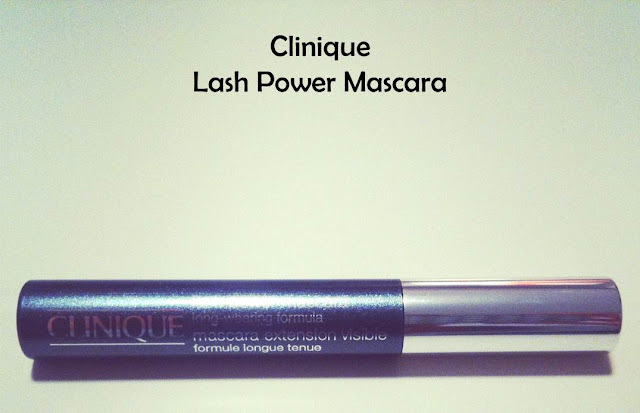 The mascara goes on smooth and can easily builds for multiple coats. The brush REALLY separates your lashes which is great for me since I don't have that many. Mid-Day: All good. No smudges or flaking to report! 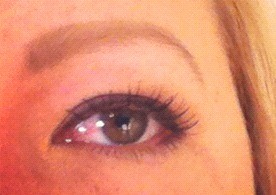 End Of The Day: Natural looking lashes yet still dark and separated. 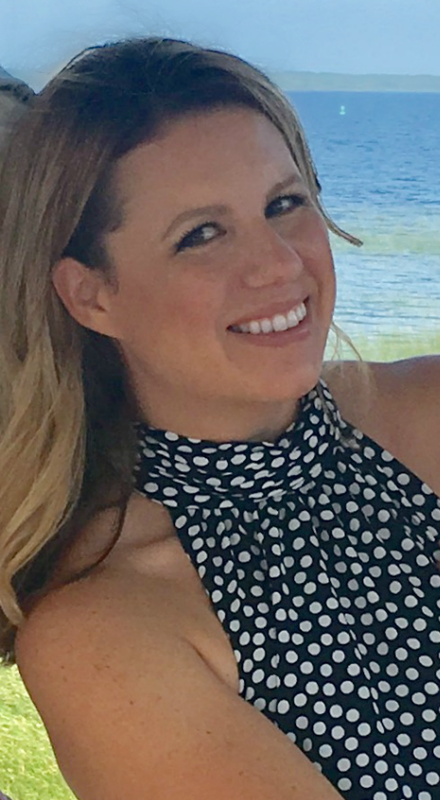 This is the perfect mascara that looks great all day, then you can easily apply more coats after work for a "night time" look. Application: I'm sure I bought this because I saw in my US Weekly that some celeb was using it...but I really wish I had not. First of all, it's a curved "spoon" brush with wacky sized bristles. So it basically forces you to apply one lash at a time. It takes me much longer to create an even natural look. It does create quite a bit of volume though as it builds layers with each stroke. Mid-Day: Wiping away few flakes on my eyelid. Mad no one told me! 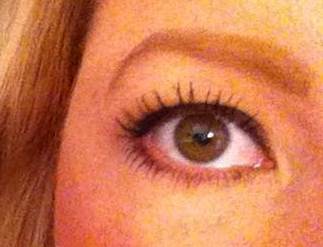 End Of The Day: My lashes look super dry and brittle like they could break off. I immediately want to get his off my lashes before I rub them completely off. 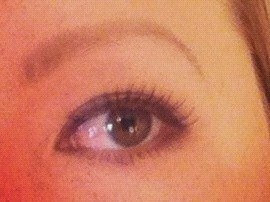 Can you sell used mascara on Ebay? Application: Last but not least the cutest mascara ever made! This mascara is made to use on your bottom lashes because the brush is teeny tiny. My only complaint is that you get a little too much mascara on your brush when you pull it out and need to wipe some off before applying. Otherwise the little brush makes it super easy to get access all your bottom lashes. Mid-Day: I should wear this more often because I can actually still tell I put mascara on my bottom lashes! End Of The Day: No complaints. Do I recommend this? 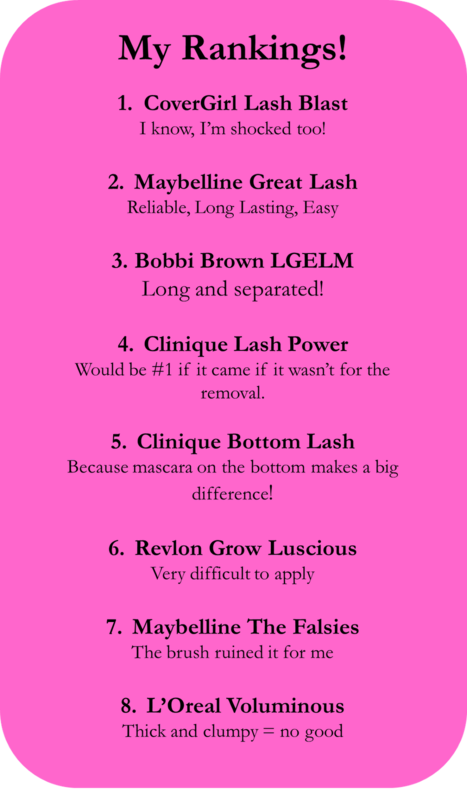 It's a toss up as you can basically get the same result with any of the other mascaras. This just forces you to take the extra time and concentrate on your lower lashes which just in turn makes them look better. This does make a cute gift though! 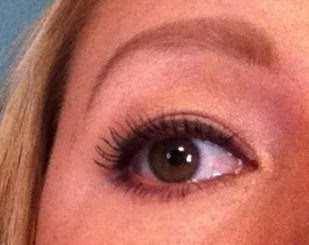 I used the CoverGirl Lash Blast on my upper lashes in this pic.